Wherever humans go microbes will surely follow, and the Space Station is no exception. November 26, 2000 -- Long before the first humans boarded the International Space Station (ISS), something else was living there. Something unseen, but potentially dangerous. Something with an uncanny ability to survive and reproduce in even the most hostile environments. Something capable of attacking the Station's crew and even the Space Station itself. Of course we're not talking about some man-eating alien from a science fiction movie. These lurking, mischievous life forms aboard the Space Station are simply microbes: viruses, bacteria and fungi. "Microbes were the first inhabitants of the Space Station," said Monsi Roman, chief microbiologist for the Environmental Control and Life Support Systems (ECLSS) project at NASA's Marshall Space Flight Center. The Space Station's microorganisms are hitchhikers; they were carried there on ISS hardware and by the assembly crews themselves. "When the Station went up, microbes went with it," says Roman. "Microbes will be the last ones in the Station, too." 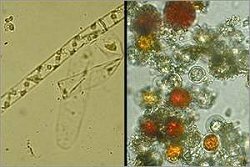 Above: When the first human crew of the ISS blasted into space on Oct. 31, 2000, a community of microbes was already waiting to receive them in orbit. The station's complement of microbes arrived in space attached to ISS hardware and on the bodies of earlier assembly crews. Microbes are a fact of life anywhere that humans go. The majority are harmless, and several types are actually beneficial to humans. Nevertheless, certain microbes can pose a health threat to the Station's crew and even attack the materials and hardware of the Station itself. Scientists and engineers at NASA must find ways to keep such microorganisms on the Space Station under control. In this third article in a series about the practical challenges of living in space (links below), Science@NASA takes a look at how microscopic inhabitants of the Space Station will be kept in check. "Just stand and breathe, and you're releasing microbes," Roman said. "You can wash and scrub and use antiseptic soap, and you'll still have microbes on your skin. You have them everywhere: in your clothes, on your skin, in your hair, in your body -- everywhere you could think of." Many people may find the thought of microbes living on and in their bodies disturbing, but living with an entourage of stow-away microbes is natural. "Generally speaking, microbes are invisible, and so people just don't think of them as much as you do some other things," said Dr. Duane Pierson, director of microbiology at NASA's Johnson Space Center. "People need to be reminded that we live in a microbial world," Pierson said. "They were here before us and they'll probably be here afterwards. We co-exist with them very well." In fact, bacteria in people's intestines help to digest food, providing some otherwise unattainable nutrients, such as vitamin K. A person's resident microbes also actually protect them from infection by competing with dangerous microbes looking for a place to grow. 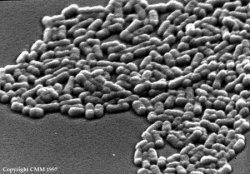 Above: A 5000x scanning electron microscope image of E. Coli bacteria. It is a normal resident of human intestines and provides vitamin K and some of the B vitamins. Image Credit: The Centre for Microscopy and Microanalysis, The University of Queensland, Australia. While it is natural for a person to live with a host of resident microbes, seven people -- each with their own set of microbes -- living in a small, air-tight can for months or years is certainly not. "When the crew goes up to the station, they'll each have their own microbial flora, and when they return back, for the most part they've exchanged that flora with each other," Roman said. Most of these exchanged microbes are fought off by the crew's immune systems and their own resident microbes, Pierson noted, but the potential for infection is there. The first step in protecting the health of the crew is testing each crewmate for infection before launch. Only healthy crew members are allowed to fly into space, and they're quarantined before launch to prevent them from contracting harmful germs at the last moment. Once on the Space Station, the air, water and surfaces with which the crew members interact must be kept clean. The air in the Space Station will be kept in constant motion, and all the air on the Station will pass through filters -- called High Efficiency Particle Air (HEPA) filters -- on its way to the temperature and humidity control systems. "The filters were originally designed to remove particulates," Pierson said. "They're very good at removing small particles," such as microbes. Microbes can ride in the air on particles of dust or in tiny clumps of bacteria or fungi. On Earth, there might be a couple hundred or thousand microbes in each cubic meter of air. Water will be disinfected by a machine called a "catalytic oxidator," which heats the water to as much as 265 degrees F. The organic molecules in microbes are oxidized by this process, which kills nearly all of them. Just to be sure, the water is then treated with iodine. After this disinfection, the water should have less than 100 microbes in 100 milliliters of water. "The water is extremely clean if you compare it to the water that you drink at home," Roman said. "The water on the Station is many, many times cleaner." For the health of the crew as well as the Station's hardware, microbes must also be kept from growing on surfaces and in nooks and crannies. "The biggest threat to the Station from the microbes is degradation of the materials," Roman said. "They'll eat pretty much anything." "As they grow on surfaces, (fungi) produce an acid which will eventually corrode the material," Roman continued. "They start using most materials as a source of food. Have you seen bathroom tile that's been overgrown by mold? Over time, you will notice that the mold has kind of eaten the tile and grout." As exemplified by the now-famous problems with mold and other fungi aboard the Russian space station Mir, microbes can not only survive in the metallic world of a space station, they can thrive. Considering the inhospitable environments in which microbes live on Earth, this should come as no surprise. "They can live in the driest deserts on Earth; they live in Antarctica and also in these deep sea vents and in that boiling water out at Yellowstone. They are very adaptable, and they can grow just about anywhere as long as they have their basic requirements met," Pierson said. Growth of microbes on the Station's hardware will be controlled in several ways. 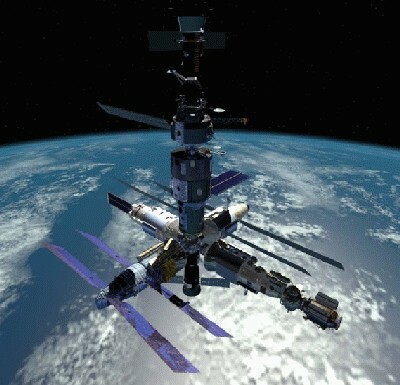 First, all materials used in the Space Station are tested for resistance to fungi, such as mold. 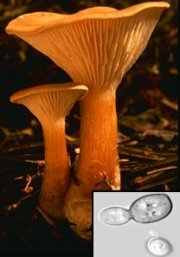 A paint with a fungus-killing chemical is also used. Controlling the humidity of the air in the Station is also an effective way of discouraging microbe growth. "If you reduce the humidity to 65 to 70 percent -- which is what the Space Station is doing -- it's harder for microbes like fungus to grow," Roman said. "They like higher humidities." And finally, the Space Station crew will keep surfaces clean the old-fashioned way: they'll clean them. 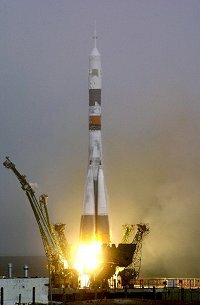 Right: The Russian space station Mir experienced problems with fungi growing on and sometimes damaging the station's equipment and structural materials. Housekeeping duties will include regularly wiping down surfaces with a cloth containing an antiseptic solution. All of these measures to minimize microbes in the air and water and on surfaces should allow the Station and its crew to conduct their mission in good health. "We have a healthy crew going up there, their food (contains very few microbes), and their water is very clean," Roman said. "So the chance of them getting sick from an infection is very low." Water on the Space Station -- The first Science@NASA article in this series about the practical challenges of extended living in space. This article looks at how water will be conserved and recycled on the Space Station -- including the crew's own urine! Breathing easy on the Space Station -- The second Science@NASA article in this series about the practical challenges of extended living in space. The systems and methods used to ensure safe, breathable air for the crew are examine in this article.